This is a Ding and Dent version of our Raspberry Pi B Block for the IntelÂ® Edison. This block has headers pre-soldered on, which means we were not able to test the board at all due to the headers being attached. We cannot guarantee that this Edison Block even works, but we knew some of you out there would still love the opportunity to get your hands on it and experiment. The IntelÂ® Edison is an ultra-small computing platform that will change the way you look at embedded electronics. Each Edison is packed with a huge amount of tech goodies into a tiny package while still providing the same robust strength of your go-to single-board computer. Powered by the IntelÂ® Atomâ„¢ SoC dual-core CPU and including an integrated WiFi, Bluetooth LE and 70-pin connector to attach a veritable slew of shield-like "Blocks," which can be stacked on top of each other. It s no wonder how this little guy is lowering the barrier of entry on the world of electronics! 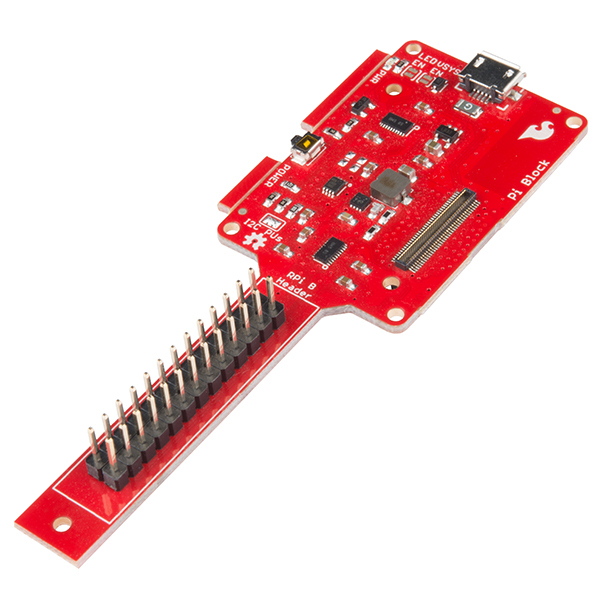 Since the Edison offers a large number of GPIO and communication bus pins, these pins can be mapped to the exact same footprint as the Raspberry Pi B s GPIO header. The Pi Block lets you use your existing Raspberry Pi B peripherals and expansion boards with your Edison while still providing level-shifted access to basic GPIO, PWM, UART, I2C, and SPI communication! This block combines the functionality of the GPIO Block and I2C Block with additional features to streamline development. We cannot accept requests/returns/exchanges, provide documentation or provide support on any aspect of these boards.